After many years of saving money a space was finally secured with a visible street front location for a local Zen meditation group. The center now offers many regular time slots of meditation for the community each week and a place where like-minded groups can rent space for events or classes. Currently two local Buddhist groups (sanghas) use the space as their home base. The outside of the center required little expect some landscaping. But the red cedar siding, and a nod toward that tree as an important local icon, helped suggest a name change for the organization as it moved into it’s new home. 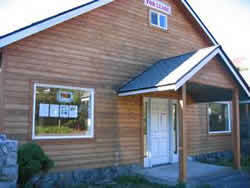 Information about the groups and the center can be found at redcedarzen.org. The inside was a different story. The landlord had kept the place as an unfinished shell, awaiting the right business or organization that could make it into what it wanted.. Besides the main room there were, in the back, two roughed-in bathrooms and a classroom, and downstairs was a kitchen/common room with access stepping right out to the alley behind. 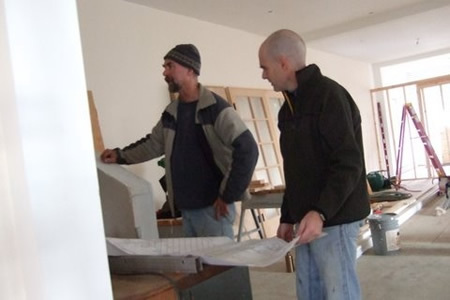 Initial design for the project was created through a committee of myself, carpenter Lou Hinkley, and resident priest Tim Burnett (both shown here). The job was fully permitted, going through all the hoops of group occupancy, fire codes, electrical and plumbing. The group used it’s savings, did fund raising, and worked out a deal with the landlord to swing about $35,000 in renovation work - the great portion of which was accomplished with donated labor. 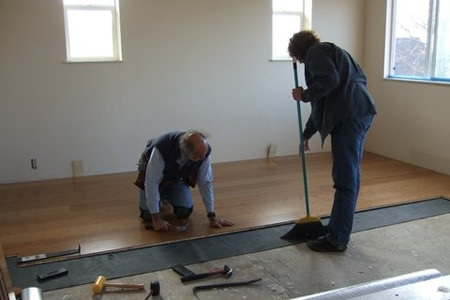 The group organized a series of work parties on successive weekends over a three month period of time. A planning committee directed all the functions to keep things on track and manage burnout by those who might get overtaxed. Dozens of people contributed time – cleaning, painting, purchasing supplies and materials, researching issues and getting answers, etc. This gave the main carpenters the ability to just come in and perform the skilled tasks that others could not do. 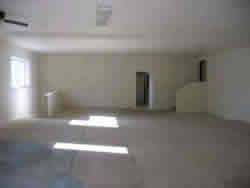 The space needed thorough painting throughout the building with about three coats of paint. This constituted one of the largest blocks of semi-skilled labor hours needed for the project. Here John Wiley, a senior member of the Zen group, paints out a bathroom. The other primary job requiring large amounts of labor was laying bamboo flooring throughout the main floor, classroom, and hallway. This required many weekends of volunteer labor. After a core group had been taught the techniques involved then the skills could be shared to others showing up on particular weekends to help. Remodeling in full swing. Stacks of flooring sit ready to be laid. Buckets of paint and supplies are ready for painting. 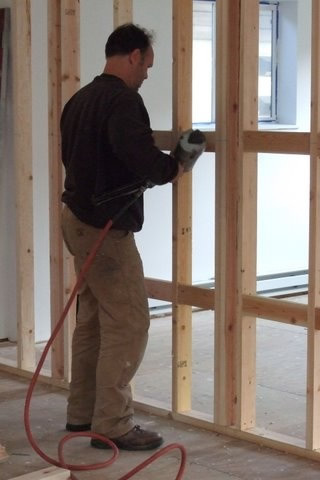 And a front dividing wall is beginning to emerge. 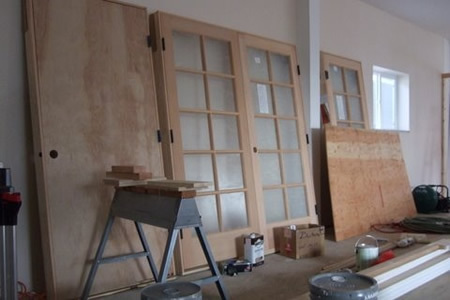 New doors are standing ready to be pre-finished by volunteers. 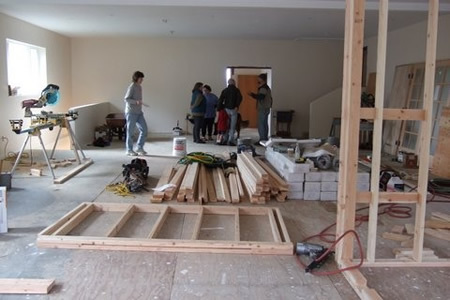 I am building part of the dividing wall separating the new front entry and library rooms on the street end of the room from what will become the main meditation space. The walls were designed to serve many functions – creating a transition into the main space, blocking sound from the street (but also allowing light through clearstory windows), and providing an integral storage closet for the many bulky meditation cushions. The cross members are being put into the wall so that an attractive paneling arrangement of contrasting cabinet grade plywood panels will have nail backing. 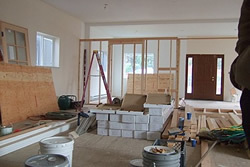 This shows the main meditation space, the completion of the three month long process of volunteer activity.